Nothing says WELCOME! more than a stunning door and a beautifully designed entrance. Think door design, color, steps, doorbells and knockers, planters as well as the color of your plants. And, when selling your home, the way you set up the entrance makes a huge difference. Door design: Consider vintage doors from a salvage shop or antique market. Refinish existing doors by sanding and staining or painting. And once you start googling door knocker designs, prepare to be blown away! Color: Don't be afraid to paint your doors in a vivid hue, create a distressed finish or even a metallic shine! The door color and texture can offer a nice contrast to the subtle body color of the home. Steps: This often neglected focal point should be kept clean and tidy, painted or parged, or you could even add bluestone steps. Brighten things up with a colorful welcome mat, or go subtle with a woven coir mat. Planters: The steps and front stoop are a good location for a selection of plants, gourds or even dried flowers. In the winter months, evergreen topiaries will keep things fresh. There's still time to plant colorful shrubs like burning bush or climbing roses near the entry to create a focal point. 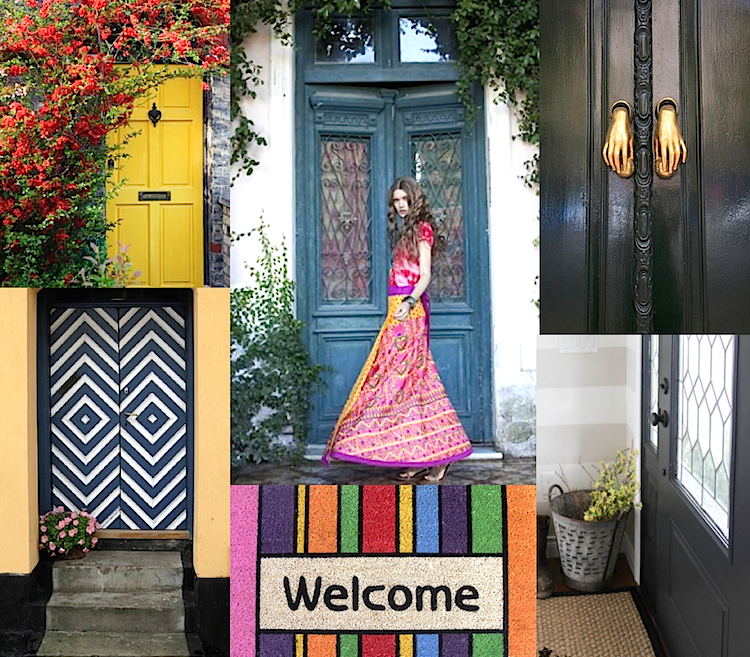 Here are some of our favorites from our Pinterest Board: Front Doors. Be sure to follow us for more Interior Design Inspiration!